It is so easy for the past to slip away, a building gets a new tenant, a new use or a new name and bingo! The past is gone. But in Cape Girardeau, Lindsey Lotz, a Southeast Missouri State University, has created posters to bring history into the present for four downtown buildings. The buildings Lotz picked to highlight include the one at 19 N. Spanish. It used to house an A&P grocery, which was part of the country’s first supermarket chain. The article notes that Lotz’s project drew together four different organizations to help her create the posters. The posters will be up through May 31 and feature these locations: 20 Broadway, 120 Broadway, 19 N. Spanish St. and 7-19 Spanish St., which will take you on a stroll past the home of the founder of Cape Girardeau, a city 3 1/2 hours from Columbia, Missouri. The project is part of celebration of National Historic Preservation Month. Read the article about the Lotz and her work here. ‘Tis the season — for home and garden tours. Each day, my inbox is flooded with releases about historic homes, via my Goggle alerts. Now, it’s filled with announcements for tours and it gives me an opportunity to bemoan Columbia’s lack of annual historic home tours. Sure, we have the Kitchens in Bloom, a tour of four homes that benefits the Boone County Council on Aging. And while these are typically beautiful homes, only rarely are the included homes historic. But this year we’re in for a treat — 716 W. Broadway, the home of Adam and Heather Plues is on the tour. According to information compiled from the Columbia’s Historic Preservation Commission and other resource, the home at 716 W. Broadway is a 1909 Colonial Revival built by John and Elizabeth Taylor House. It was placed on National Register of Historic Places in 2001 and was once a bed and breakfast, which closed in 2012. The house has since been purchased and spruced up on the outside and now is your chance to see the inside. Here’s an image of it from when it was named to the Notable Properties List in 2002. 716 West Broadway, photograph by FitzImages Photography/City of Columbia Historic Preservation Commission, used with permission. Yet, for demons for more historic home views, this is not enough. I’d love to see all the homes named to Columbia’s Notable Properties List since its inception in 1998 and all of them on the National Register of Historic Places. Wouldn’t you? That’s why I’m working on a book proposal to cover 25 to 50 of these homes — or other homes still yet to be lauded that highlight Columbia’s history. Here’s a list of all of the honored homes in Columbia — which ones would you put on the list of 25 to 50 homes to be included in the book I’m working on? Don’t be shy. Tell me if I’m missing one and tell me what you want to see. 2 E. Stewart Road, ca. 1929, Spanish Eclectic. Daniel A. and Gona Wilkerson House. Named to Notable Properties List in 2004. 7 Edgewood Ave., ca. 1926, Craftsman Bungalow. Harold and Buelah Parrish. 10 N. Fourth St., 1889, Late Victorian, John William “Blind” Boone house, named to the National Register 1980. 102 N. Glenwood Ave., 1919, Craftsman Bungalow. Henry and Lillian Kreutz Home. 111 S. Glenwood Ave., ca. 1908, Craftsman. James A. Hudson Home. 121 N. West Boulevard, 1934-1941, Tudor Revival. The former log cabin of Arch and Blanche McHarg. Original log cabin elements are part of current structure. Named to the Notable Properties List in 2004. Read about the “Hansel and Gretel House,” in this Missouri Life article. 201 E. Brandon Road, 1937. Colonial Revival. Margaret and Sidney Neate. 201 S. Glenwood Ave. ca. 1929, Georgian Revival, Mary Garth Gordon. 201 E. Brandon Road, built 1937. Colonial Revival. Margaret and Sidney Neate Home. 202 S. Glenwood Ave., ca. 1918, Colonial Revival. Home of Hulda and Walter Williams, the founder of the School of Journalism at the University of Missouri. Named to Notable Properties List in 2004. 206 Bingham Road, 1928, Tudor Revival. Harry Satterlee and Florence Henderson. For more information, see these this article from 2012 when this home was named to the Notable Properties List: Six properties to be honored by Columbia’s Historic Preservation Commission. 206 S. Glenwood Ave., ca. 1909, Colonial Revival. Laura Matthews home. 211 Westwood Ave., built 1911, Craftsman. George Reeder house. Read more about the house in this article, Honoring historic homes published in Mizzou, magazine of the Mizzou Alumni Association. 211 Bingham, ca.1927. Georgian Revival. Margaret von Holtzendorff. 211 Westwood Ave., ca. 1911, Craftsman. George Reeder. 214 St. Joseph St., ca. 1903, Late Victorian. George Harrell Jr. Home. At one time, Harrell ran a dry cleaning business at the rear of the property. 300 N. Tenth St., ca. 1882, Italianate. Samuel H. and Isabel Elkins House. 300 S. Glenwood Ave., ca. 1920, Georgian Revival. Ruby M. Hulen House. Two-story brick home of Georgian style that was designed by a visiting professor from England. 302 Westwood Ave., 1909, Colonial Revival. Ralph Harris. 313 E. Brandon Road, ca 1940. Colonial Revival. Newell S. and Fern R. Gingrich. 404 Thilly Ave., 1910, Craftsman. Robert and Ivy Selvidge Home. 503 Edgewood Ave., 1910 ca., Craftsman. W.C. Davidson House. 504 Westmount, 1906, Craftsman. One of the three “Peanut Brittle,” houses, this one was built by Winterton C. Curtis The “Peanut brittle” houses were all built using unorthodox construction methods, e.g. exteriors 7-inch-thick concrete blocks with small rocks embedded in them. 509 Thilly Ave., ca 1909, Craftsman Foursquare. Emma and Lincoln Hyde. Lincoln Hyde was a professor of bridge engineering at the University of Missouri. The four-square brick structure includes lower level exterior walls three bricks thick while the second floor is two bricks thick. The limestone used for the foundation was mined from the same site as that used to create MU’s White Campus. Read more about the house in this article, Honoring historic homes published in Mizzou, magazine of the Mizzou Alumni Association. 511 S. Glenwood Ave., ca. 1916, Colonial Revival. William A. Miller. 511 Westwood Ave., ca. 1916, Craftsman. Grace and Dr. Edwin B. Branson. Dr. Edwin Branson was the chairman of the Geology Department at the University of Missouri in the early 1900s. The house is built of gunnite, a type of mortar conveyed through a hose at high velocity. The interior and exterior decorative features include wrought iron from New Orleans. Read more about the house in this article, Honoring historic homes published in Mizzou, magazine of the Mizzou Alumni Association. 602 Sanford Place, ca. 1869, Italianate. Sanford and Kate Conley House. 608 Westmount, 1906, Craftsman. One of the three “Peanut Brittle,” houses. 610 W. Broadway, ca. 1921, Craftsman. A. Fredendall. Named to the Most Notable Properties list in 2011. It was built by A. Fredendall, pioneer Columbia clothier and merchant. It was later owned by the H.R. Mueller family, which owned and operated the HRMueller Florist Co, according to the West Broadway Historic District Property Information Form prepared by Debbie Sheals, which is available online here. Read more about the house in this Feb. 15, 2011 Columbia Missourian article. 700 W. Broadway, ca. 1908, Late Victorian. John A. and Clara Stewart home. 700 Mount Vernon, ca. 1911, Colonial Revival. Robert and Lura Tandy. A 2-story farmhouse, the south side of the home was the original front, and then had an Amelia Street address. 703 Westmount, ca. 1909, Craftsman. W.D.A. and Frederica Westfall Home. 704 Westmount, 1906, Craftsman. One of the three “Peanut Brittle,” houses. 709 W. Broadway, ca. 1920, Colonial Revival. Eugene Heidman House, once owned by E.F. Heidman, owner of long-time downtown drug store Peck’s Drug Store. Named to the Notable Property List in 2004. 711 Thilly Ave., 1959, Mid-Century Modern. Perry and Ella Phillips Home. Contemporary style by architect Harris Armstrong. 716 W. Broadway, 1909, Colonial Revival. 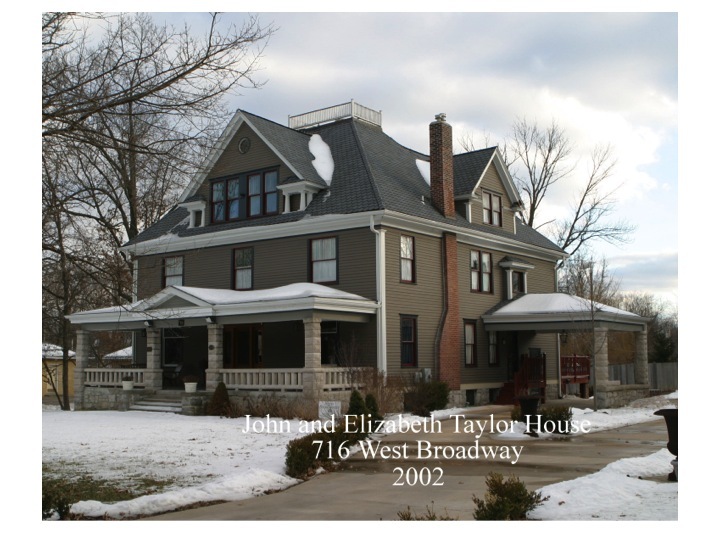 John and Elizabeth Taylor House, placed on National Register of Historic Places in 2001. Learn more and see pictures here. The house was once a bed and breakfast, but was closed in 2012. The house was on the market for $659,900, according to Trulia, but has since been sold. Yet, you can still see pictures on Trulia here. 803 Alton Ave, ca. 1914, Vernacular. Harvey and Eugenia Wieghtman House. 809 S. Providence Road, ca. 1878, Classical Revival. George and Margaret Rollins. 818 W. Rollins Road, ca. 1910, Queen Anne. A.W. and Bernadine Blanks. 901 N. Rangeline St., ca. 1920, Craftsman Foursquare. F.T. and Masie Leebrick House. 903 S. Providence Road, ca., 1929, Colonial Revival. Charles and Reginia McGinley home. 905 S. Providence Road, 1925,Tudor Revival. Bessie W. and Dr. J.E. Thornton. Named to Notable Properties in 2014. 915 S. Providence Road, ca. 1928, Colonial Revival. Orville and Maude Barnett House. 916 W. Stewart Road, 1932, Tudor Revival. Claude and Stella Woolsey House. Named to the Columbia Most Notable Properties list in 2013. See the article about that here. 917 Edgewood Ave., 1952, Mid-Century Modern. T.W. and Elizabeth Bretz. 917 S. Providence Road, ca. 1938, Colonial Revival. Victoria D. and Elmer H. Almquist. 920 Cherry St., c. 1837, Niedermeyer Apartments with its 30 apartments is, in effect, many homes. Named to 2013 Columbia Notable Properties List. 923 S. Providence Road, 1954, Ranch. Donald S. and Mary A. Chaney House. 927 S. Providence Road, ca. 1941, Colonial Revival. Sen. Roy D. and Nellie M. Miller House. 929 S. Providence Road, ca. 1939, Colonial Revival. J.E. and Fannie M. Bardelmeier House. 1252 Sunset Drive, ca., 1939, Cape Cod. Albert and Thelma Trombly House. Built by a former member of the English Department at the University of Missouri. 1312 W. Broadway, 1840s-1892, Italiante I-House. Edward Camplin House. Started as a log cabin before becoming Booneslick Inn and the Springdale House. Named to the Notable Properties List in 2004. 1315 University Ave., ca. 1926, Craftsman. Harry B. Roth. 1404 E. Broadway, 1905, Late Victorian. Olive and Kennard Chandler. 1502 Anthony St., 1939, Tudor Revival. Francis Pike House. Named to Notable Properties in 2014. 1516 Wilson Avenue, circa 1916. Colonial Revival. Walter and Helen Guthrie Miller House. 1526 Wilson Ave., ca. 1916, Colonial Revival. Walter and Helen Guthrie. 1601 Stoney Brook Place, ca., 1876, Vernacular I-House. County Infirmary Building. This home may be Boone County’s oldest home according to this Feb. 5, 2008, Columbia Missourian article. According to city records, the land was purchased in 1854 by the court from Murdock and Anne Garrett to establish a county infirmary or poor farm for the county’s indigent citizens. The infirmary was erected in 1864 and was maintained by the county until 1898 when the land property was sold to J.B. Turner. This property represents the 100th selection of Most Notable Property by the Historic Preservation Commission. 1602 Hinkson Ave., ca. 1906. Queen Anne/Dutch. Joseph and Mary Duncan House. Named to the Most Notable Properties List in 2011. See this Feb. 15, 2011 Columbia Missourian article. 1620 Hinkson Ave., ca. 1895, Queen Anne. Sally Flood House. She was one of Columbia’s first primary school teachers. One of only a few Queen Anne-style Victorian homes in Columbia. Named to the Notable Properties List in 2004. 1719 University Ave., ca. 1938, Colonial Revival. Merle M. and Grace Prunty. 1844 Cliff Drive, ca. 1950, Mid-Century Modern. David and Helen Pinkney House. 1863 Cliff Drive, ca. 1950. Mid-Century Modern. Mary Coleman home. 2007 S. Country Club Drive, ca. 1927, Tudor Revival. Built by Barry McAlester, son of A.W. McAlester, who helped develop MU’s School of Medicine. The McAlester’s family crest presides over a living room which showcases a fireplace adorned with limestone carvings. The dining room features hand-painted wall paper, according to this article, Honoring historic homes published in Mizzou, magazine of the Mizzou Alumni Association. The home across the street, 2000 S. Country Club Drive, once stood on this spot. Barry McAlester moved that home which he’d also built so he could build this home on what he considered the better location. 2011 N. Country Club Drive, ca. 1883. Second Empire. Built for Dr. Andrew W. McAlester as a part of his 160 acre farm. McAlester helped develop MU’s School of Medicine. The stone gates at the head of Country Club Drive served as his entrance and the entire County Club area was a part of his farm. The house consists of oak framing with cedar lap siding on a concrete brick foundation. Read more about the house in this article, Honoring historic homes published in Mizzou, magazine of the Mizzou Alumni Association. 2815 Oakland Gravel Road, ca. 1862, Italianate. The David Guitar House, later became known as Confederate Hill. Named to the National Register of Historic Places on Sept. 9, 1993. This home is currently owned by Pat Westhoff and Elena Vega who purchased it on Oct. 18, 2010 at absolute auction for $155,500. The house previously had been on the market for $499,000. According to this Oct. 4, 2012 article, Slave cabins in Boone County, the property has a slave cabin on it. 2911 Old Highway 63 South, 1925, Craftsman. Annie Fisher House. DEMOLISHED, 2011. Read more in this Nov. 29, 2011 article in the Columbia Daily Tribune. This link will take you to a photo of the house. For more information, click here. Annie Fisher, the daughter of slaves, became one of Columbia’s first African-American business owners. She operated a restaurant and catering service out of this house, which was named to Columbia’s Notable Properties list in 2009. 3005 Mexico Gravel Road, 1827-1836, Federal I-House. Greenwood Heights. Read more about it on this Columbia Historic Homes page. 2911 Old 63 South, Annie Fisher House DEMOLISHED, 2011. The now demolished Annie Fisher House once resided on Old 63. It was the home of one of Columbia’s first African-American entrepreneurs. She operated a restaurant out of this house. 3700 Ponderosa Drive, 1877, Italianate. Maplewood House. Named to the National Historic Register 4/13/1979. This house is open to the public for tours on Saturdays and Sundays, May through September. For more information, call 573-443-8936 or click this link. According to this Oct. 4, 2012 article, Slave cabins in Boone County, the property has a slave cabin on it. 4713 Brown Station Road, ca. 1915. Vernacular. An auction was set for August 17, 2013 on this building which was built as Keene School, a two-story brick schoolhouse, with living quarters for the teacher on the second floor. Today, it is used as a residence. It was added to Columbia’s Notable Property list in 2004. 3801 Ponderosa St., 1925, Vernacular. Shotgun house, formerly at Garth Avenue and Worley Streets, built circa 1925, recently moved to the developing outdoor museum at the Boone County Historical Society. Getting a look inside a historic home can be a challenge. Few of us are willing to knock on someone’s door and ask for a quick tour. But these four ways can give you a genteel way to see inside historic homes. But these are only four ways to look inside a historic home. How have you found ways to see inside a historic home that has piqued your interest or is too far away to visit? I’d love to hear your tips on getting a glimpse. 1. Books provide an easy way to getting a look inside some amazing, even luxurious homes. These four books recent books on historic homes offer lush pictures, interior and exterior views and information on the builders of the homes as well as the present residents. The books and the homes the authors included reveal a wide range of history. All the books hail from the last six years, giving readers a current view of the wealth of historic homes available to see via the written page or in person on self-proclaimed historic home tour. The books cover the country, ranging from Naples, FL, Jefferson, Texas, Lake Minnetonka, MN to the grand dame of historic homes, New Orleans. By the way, there’s no need to go broke buying the books. Your local library should be able to get them for you on interlibrary loan. That’s what how I obtained them. Dream houses: Historic Beach Houses and Cottages of Naples with text by Joie Wilson and photos by Penny Taylor describes how Naples began as a wealthy playground on the sea. With images including water colors, photos, old postcards and even a map, you’ll feel as if you’ve stepped inside these beach homes. Historic Homes of Jefferson, Texas by Cheryl MacLennan is clearly a labor of love. As she states, you can almost hear the clop clop clop of horses in this small town of 2,000, relegated to history when the Corps of Engineers changed the nearby waterway putting an end to the steam boat traffic. The result is a quiet place filled with the sumptuous homes built prior to the loss of steamboat traffic. Legendary Homes of Lake Minnetonka by architectural journalist Bette Jones Hammel and photographer Karen Melvin gives you a rare, privileged view of these lush homes built by the scions of industry from the past and today. The homes highlighted range from historic homes to more recent modern installations. The book gives you a view of these homes you won’t be able to get in any other way. Plantations and historic homes of New Orleans by Jan Arrigo. A New Orleans based freelance writer and fine art photographer gives you a view that even a tour of these historic homes won’t give you because she includes the history of the homes and provides the context of history, development, culture and even fire and flood to provide an appreciation of these historic homes. 2. Historic home stays — Books are dandy, but staying in a historic home gives you an even greater opportunity to enjoy historic homes. Jefferson, Texas bills itself as the Bed and Breakfast capital of Texas, and the Visit Jefferson Texas website offers a long list of spots to stay the night in a historic home. All four books provide interior and exterior shots, but they also include close ups of the surprising features of historic homes. Several of the books include photographs of the gardens as well. 3. These homes talk — Via the books, you can hear the tales of trouble, success and happiness from the shores of Naples to the peace of small-town Jefferson, Texas. The lure of a historic home goes beyond the board and mortar to a desire to touch the past, and these books bring the past alive, and several include comments from the present residents disclosing their belief they’re saving the homes for future generations. 4. Museums preserve and reveal — The Old South is gone, as are the pioneers who founded New Orleans, but their tales and tragedies live on in the museums of the plantations and historic homes of New Orleans. The book Plantations and historic homes of New Orleans take on you a tour of more museums than you could probably take in during a visit to the Big Easy, explains how some places survived the floods of Hurricane Katrina, and more, all without you having to leave your reading spot at home. If you’ve been bitten by the historic home bug, I’m betting you’ve found a few other ways to get a peek inside a historic home or two. Share your tips and ideas on how to see beyond the outside of a historic home, near or far. Bet you didn’t know that Chapel Hill Road used to be West Boulevard South. Which now makes sense of the fact that the rest of West Boulevard often has addresses such as 121 West Boulevard North. This street name tidbit came out at the April 1, 2014 event honoring the 2014 Most Notable Properties named by the Columbia Historic Preservation Commission. Gaining one of these honors for a historic building 50 years or older was the Fairview Methodist Church. What? Can’t find the church? That’s because it’s now Countryside Nursery School. Which one of the presenters honored as Columbia’s longest operating day care. Except it isn’t a day care. Have you come across other such “used to be” names in Columbia, Missouri? How did you find your way or uncover the reason behind the name? It’s this kind of thing that can make Columbia, Missouri so confusing. At the event, Carol Notbohm, the former owner of Countryside Nursery School, talked about how when she moved here in the 1970s after retiring from teaching, the little church on the hill called to her. By then, it was vacant, after the congregation outgrew it and moved to a new church at 3200 Chapel Hill Road — with a website that calls it the Front Lawn Church. But the first church did give the new church’s location its name. Chapel Hill used to be the southern portion of West Boulevard until around the time the first Fairview Methodist Church was built. With the church in the location, it was renamed Chapel Hill for the church on the hill. And Fairview Methodist Church was named because an early church member commented that it looked so pretty on the top of the hill, according to a report by Deb Sheals, a historic preservation consultant cited in an article about the new Most Notable Properties. It’s this kind of making sense of things that the Columbia Historic Homes website and history itself does. Have you might stumbled on a fact or information that helps make sense of Columbia? Let me hear from you about what you’ve discovered that keeps you from getting lost or confused. What to read the entire article about the event on Tuesday, marking the five new Most Notable Properties? Here’s a summary and link to the article by Andrew Denney. April 2, 2014 — Historic properties celebrated at 15th annual Most Notable event — Outlines a few facts for each of the five properties named to the Most Notable properties list by Columbia’s Historic Preservation Commission. The properties are: Fairview United Methodist Church at 1320 S. Fairview Road., Fairview Cemetery at Chapel Hill and Fairview Road, Francis Pike House at 1502 Anthony St., Bess and Dr. J.E. Thornton House at 905 S. Providence Road. Columbia Tribune. What’s an LP and why should we clean it? When I was in high school in the 1970s, the newest music technology was an LP, short for long-playing record. It was a big improvement on the 45 rpm (revolutions per minute) record that only played for a few minutes and then had to be replaced with another record if you wanted to listen to more music. Or you could use a record scratching device that allowed you to pile a stack a pile of records on a pole, allowing them to drop one by one to be played when the arm swung over with a needle to play the grooves in the record. Sound like greek? That’s because today, most of us use DVDs or MP3s or some other kind of electronic music storage and playing. But back in the day, the newest kind of record was the LP. And since people handled those records, as my brother would tell me, “You’re going to get oil and grease from your fingers on the record. Handle it from the edge!” And that oil from my fingers, my older brother explained, fouled the grooves that recorded the music, degrading the sound over time. Well, sometimes I listened to my brother and sometimes I didn’t, and it seems that a lot of other people had the same problem.That’s why Bruce Maier invented Discwasher to clean the LPs. And if you do a search on the term, apparently some people think the product was the best ever. The company was sold over and over, and some LP gurus say the new product isn’t good for the LPs, but that’s not the point here. The point is all this arcane information might be gone if it were not for the house at 2000 S. Country Club Drive, where Maier lived from 1975 to 1984. That’s right. Historic homes can help us tell the story of our history by keeping those names and the stories of those people alive. Today, that house is owned by Russell and Mary Still, a former Missouri representative. While looking solid as the rock it is built from, the 1910 house actually once stood across the road until 1924, when its builder, Berry McAlester, moved it so he could build an even finer house on that spot. Does the name McAlester sound familiar to University of Missouri alumni? It should. Berry’s father, A.W. McAlester is sometimes called the father of the MU’s School of Medicine. He was the dean of the School from 1883-1909. There’s a building named after McAlester and that is keeping his name alive, the same way the house at 2000 S. Country Club Drive is keeping the name of Berry McAlester and Bruce Maier and the Discwasher alive. This history was highlighted in this article, “Delightful Contrasts,” I wrote in 2010 for Columbia Home magazine. In the article, Mary Still notes the house is keeping up with the times, but retains the elegance of its past. Are there any other houses in Columbia that you know of that hold that kind of history, the kind that could be so easily lost as we move from LP to MP3? 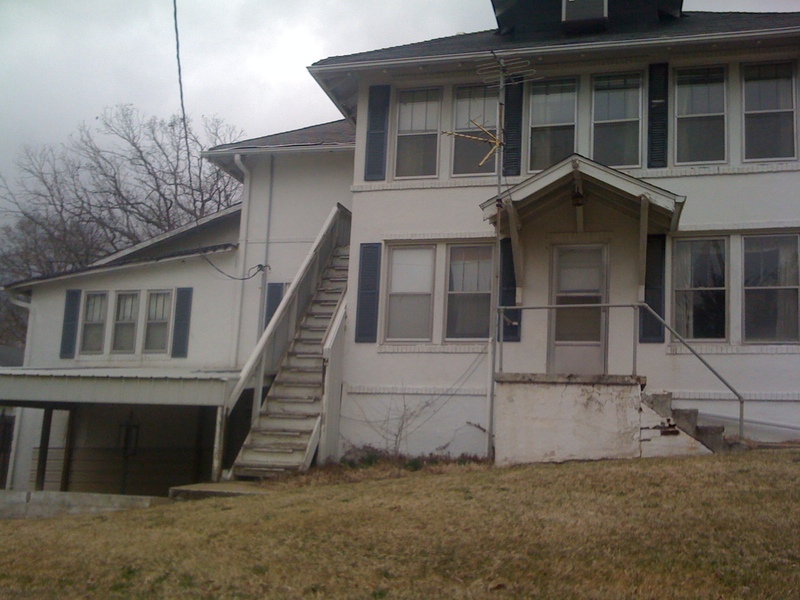 I’d love to hear the stories you know about the houses of Columbia, Missouri.